The gradual loss of memory and the associated difficulties of performing simple tasks, is a hallmark of dementia. It is generally insidious and not always noted by the sufferer, but loved ones have usually been aware of the difficulties, but have most likely been reluctant to comment, assuming it is, 'just old age'. Thankfully there is an increasing awareness of the burden of dementia, although there is a lively debate about the merits or otherwise of early diagnosis (see recent BMJ articles and comments-although you have to be a BMA member or use library access to see it). I'm of the opinion that each case should be judged on it's merits, and that a blanket approach of assuming everyone would like to be informed is taking the non paternalistic approach of medicine too far. For Christians and Christian churches there is a particular challenge; not to be so enamoured with the vibrancy of youth that ageing members, and those with dementia, are neglected. I was at a meeting in Bedford yesterday of the local support group for Pilgrims Homes. One particular comment from Brian Edwards the retired pastor of Hook Evangelical Church, really struck me. He wondered if churches which employed a youth pastor might also include within the remit, a responsibility to encourage the your people of the church to visit the elderly and generally show interest in them-perhaps even attending and taking services at the care homes where some of the older folk with dementia might be living. In his excellent book, Is faith a delusion, Professor Andrew Sims the former President of the Royal College of Psychiatrists, notes that as a young Christian he was motivated to go into psychiatry on the back of that verse. It seems to me especially appropriate as we think of those (and their) carers sliding into dementia, that we see this as a particular responsibility, particularly to speak up for them and indeed defend them. Louise Mores on behalf of Pilgrims homes has written an excellent introduction to the subject in her book, Could it be dementia? 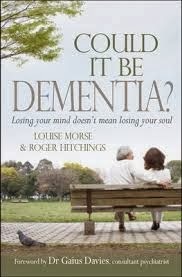 There are particular aspects of dementia which are a challenge for the Christian believer and she addresses these well. She also reminds us of great resources in the Scriptures, the fellowship of the church, and the deep seated memories of ageing Christians who at times can pray lucidly and sing along to some of the great hymns of the faith. All the more reason to keep singing some of those great historic hymns, in addition to the wonderful contemporary hymns of Getty and Townsend, so that the words and their associated truth get into our marrow.